Our growing need for energy – and our desire to make more of it renewable – has set up other tensions, beyond where to put big power lines. 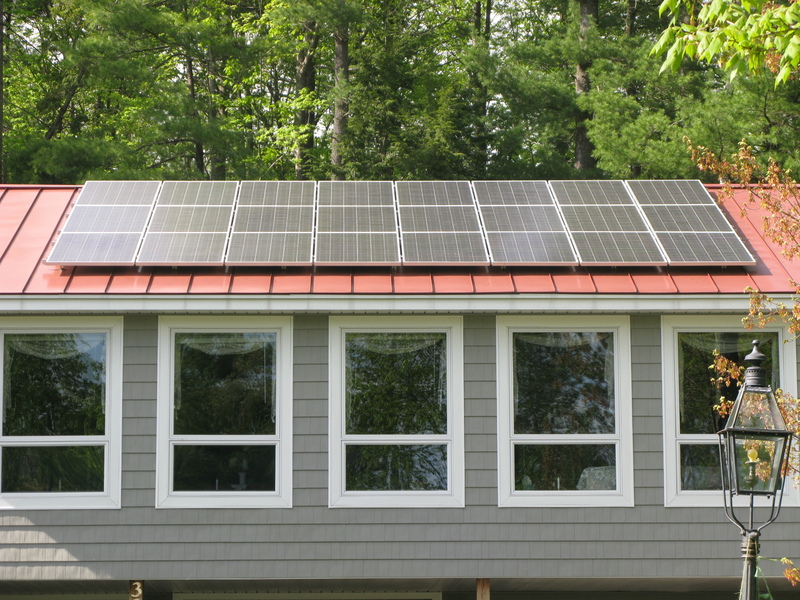 There’s long been a dispute over how to account for so-called “Behind-the-Meter” (BTM) solar, the kind you might put on your home or business to try and get “off the grid.” Energy analysts are seeing that, especially during heat waves like the one that’s gripped New England for much of the summer, this rooftop solar can actually have a big impact on our energy needs. 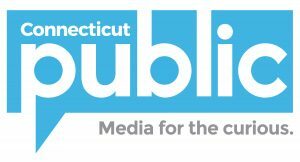 We spoke with Sam Evans-Brown, host of NHPR’s “Outside/In” podcast, about this trend. You can find the Twitter thread by Joe LaRusso which referenced this interview here. These interview highlights have been lightly edited for clarity and length. 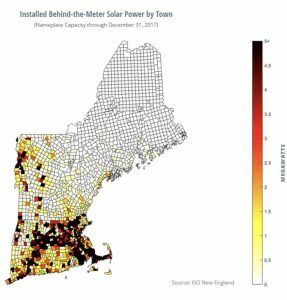 John Dankosky: We were following a Twitter thread from Joe LaRusso, who’s the Energy Efficiency and Distributed Resources Finance Manager at the City of Boston, where he was sharing some statistics about Behind-the-Meter Solar. Take us through what he was trying to tell us about BTM solar. Sam Evans-Brown: BTM solar is of course solar that’s been installed at a site that’s operating ‘Behind-the-meter.’ So it’s not the kind of thing that the grid operator can just call on and say what’s happening over on your solar array, it’s stuff that they have no real visibility into. What Joe was doing is he’s pointing out something that solar advocates have been arguing might have been theoretically true for some time, which is that during peak demand events, like really hot sunny days, photovoltaic arrays are just cranking because that peak happens in the afternoon on sunny days, and that’s when solar panels are operating. We care because at these moments of peak demand we rely on some of the dirtiest and most polluting power plants in our New England fleet that sit idle for a huge chunk of the year and are incredibly expensive to run, so anything that reduces that peak demand on these hot days is very important for reducing pollution and carbon emissions and, of course, saving us a lot of money. So Joe’s tweets, what they did is they took an ISO New England press release about operations during this heatwave and he broke out the numbers and he pointed out that at the moment where we historically see peak demand, which was around 2 p.m., there were 2,000 megawatts of photovoltaic generation on the grid. So at that moment, BTM solar, this stuff that the grid has no real visibility into, was producing about 11% of New England’s electric demand. So that’s a lot of expensive, and dirty peak generation that’s being displaced. We also saw a BTM solar map that actually went town by town across our region. What did that show us? It shows us that policy matters. If here in New Hampshire we have something called a Renewable Portfolio Standard, it’s an incentive regime for small and large renewable energy generators, and Massachusetts has one as well. So if you compare New Hampshire and Massachusetts and look at this map, you see there’s very little solar in New Hampshire and Massachusetts has a ton. If you dig into the policies, a renewable energy credit, which is the unit, it’s like a market-based-unit of renewable characteristics of electricity that you can sell and get reimbursed for having solar on your roof. In New Hampshire versus Massachusetts, it’s one-tenth of the price. 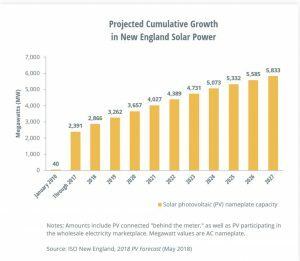 So a Massachusetts incentive is ten times as generous as the New Hampshire ones and so of course what you see is there’s a ton of solar in Massachusetts, almost 23 times as much in the Bay State as here in the Granite State. So what you see is state policies have been what’s driving the deployment of this solar. If BTM Solar takes pressure off of the grid, it probably prevents rolling blackouts, it’s going to cost us less over time. I’m wondering, why don’t we see more states take the road Massachusetts is taking and try to put more BTM Solar up? Why aren’t we seeing more of this in New Hampshire and other states? This has been the argument for years. When you install solar behind the meter, you as a buyer of electricity, you’ve reduced your electric bill but you’re still getting benefits from the grid. And so this has been this anti-solar talking point for a very long time is that you’re pushing the cost of maintaining the grid onto non-solar costumers. And the real energy nerds have always been pointing out that solar has this benefit of decreasing summer demand and that benefit accrues not just in reduced pollution, but in reduced cost to the whole grid. So the question has always been, how much is this benefit worth, and are solar owners saving the grid as a whole more money than they’re pushing off on the rest of us? And all of the studies that I’ve seen on this question say that yes, especially in this early phase of solar deployment, BTM solar customers save us more money than they cost us. But here’s where it gets really slippery, as we’re getting more and more solar, producing more and more electrons at the same time of day, supply and demand, the market says that each of those incremental megawatts will be worthless, and so the benefit to the grid starts to decline as we get more solar. So eventually there will be this moment of reckoning where the value of intermittent solar will start to plummet and the solar industry and the grid as a whole will have to wrestle with that. California is always in the lead on these issues. What can we learn from the state? In California you see what happens when you have rampant growth of BTM solar but no real additional policies, early on anyway, to deal with the effects on the demand. So there’s this thing called the ‘Duck Curve.’ So if you imagine a graph of solar demand over the course of a summer day in New England, what you see is this gradual rise from the morning when everyone first wakes up, peaking around 2 p.m. when it’s hottest and the air conditioning is really cranking, and gradually falling again when temperatures begin to fall and people go to bed. But in California, these concerns that we’re putting out so much solar, putting electrons onto the grid in the middle of the day, that that long slow curve would get interrupted mid-morning and demand would begin to fall because of all the solar cranking out, so demand slumps through the sunniest part of the day, but then as the sun starts to go down, would rise very steeply in the afternoon as people return from work. And the problem there is there was this concern that power plants wouldn’t be able to ramp up quickly enough to deal with this surge in demand. That was this concern in California. They were the first to cross the wire installing a lot of BTM Solar and they were the first ones to start to have to wrestle with this and figure to what to do to keep the lights on. And so there’s a lot of things they’re working on, you can increase energy storage, of course, that’s the golden child that usually gets mentioned, but there are also demand-side measures, you can create incentives for people to switch their electric usage, with appliances like washing machines and dryers and hot water heaters, towards low demand times and that will help to smooth out the Duck Curve. They say you can teach the duck to fly.